The Funky Felter: Early Bird Valentine's Day Special! 50% off Heart Pendants, Rings, and Hairpins for three days only! Early Bird Valentine's Day Special! 50% off Heart Pendants, Rings, and Hairpins for three days only! The Early Bird gets the worm - er, I mean gets the heart! Valentine's Day is less than a month away, and now is the time to get your cute, fuzzy felted heart accessories for an outrageous discount!! 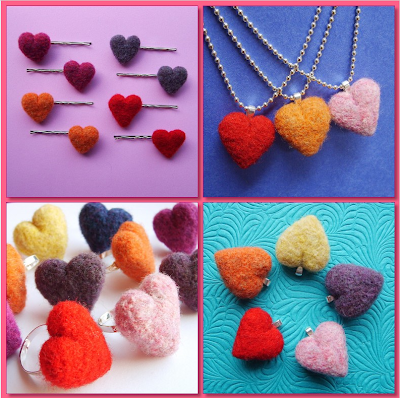 Surprise someone this Valentine's Day and let them know how much you love them, or just treat yourself to a little bit of fuzzy felted bling. For the next three days, I'm offering 50% off my needle felted heart pendants, rings, and hairpins in both my Etsy shop and ArtFire shop. This promotional discount is a limited time offer for my blog readers and newsletter subscribers only. The catch is that you must use the promo code "BLOGLOVE" in the message to seller at checkout and pay via PayPal by PayPal account or major credit card. If you do not use the promo code "BLOGLOVE," then you won't receive the discount. In my Etsy shop, you can type in the promo code during the Etsy checkout process in the space provided for a message to seller. In my ArtFire shop, you'll need to type in the promo code in the PayPal message to seller when checking out. Once you've checked out and payed, I'll refund 50% of the item price on any heart pendant, ring, and/or hairpins purchased. (If you'd prefer to receive an updated PayPal invoice before paying, please Etsy conversation or email me to let me know.) And, there's no minimum or maximum limit on quantities so if you'd like a larger custom order, please email me or Etsy conversation me with the details. Be aware that larger orders do take longer to make and ship though. Currently I also have free shipping to the US, UK, Canada, and Australia on these items and very low shipping costs to the rest of the world. You can't beat that deal! This amazing discount is good from today, Monday, January 19th, through Wednesday, January 21st, at midnight. This is the absolute best discount that I will offer on my needle felted heart jewelry so don't miss out! They really are the ideal gift for Valentine's Day. Absolutely gorgeous! beautiful ring arrived in lovely, very well protected packaging. I'm thrilled! Absolutely adorable in every way. Great item, great packaging, nice handwritten thank you and special bonus. Can't wait to buy more and more and more!!! Thanks so much. I loved the whimsy of this ring. I love felted items. It was so cute I went ahead and gave it to my sister before her bday. Thanks for shipping so quickly also. I look forward to being a return customer. what a great sale! I'm eyeing the felted heart ring! Me too! I love the rings! Sooooo cute, I love all of the hearts!!! Great article, I have my own blog http://herdailydish.com I would love to add you to my blog roll and hope you will do the same - let me know your thoughts. I am also part of www.ShesConnected.com you should check it out and add your profile, it's a great way to promote your business and blog.